For more than 30 years, no new medical treatment has emerged to treat chronic sinusitis. Thanks to groundbreaking clinical research led by Dr. Joseph Han and his colleagues at Eastern Virginia Medical School (EVMS), that’s about to change. Dr. Han’s studies in the emerging field of biologics have helped spur the development of monoclonal antibody therapies to target specific cell messengers, in this case those linked to abnormal immune system signals to inflammatory polyp growth. He expects that there likely will be multiple biologics used to treat patients with chronic sinusitis and nasal polyps. An internationally-known researcher and educator, Dr. Han has received millions of dollars in basic science and clinical research funding during his career and served as lead principal investigator for several major multicenter trials. In recent years, he has focused on phenotype and endotype of chronic sinusitis. Information gained from understanding the condition on a broad and cellular level can contribute to the federal approval of several promising new treatments. With polyps, Dr. Han zeroed in on Interleukin-4 (IL-4), a cytokine, as one of the targets for therapy of nasal polyps. Given that finding, he expects the injectable medication dupilumab (Dupixent) – already used to treat poorly-controlled asthma and atopic dermatitis – will soon gain FDA approval for patients with nasal polyps. “Until recently, there have been very few options to stop these polyps from reappearing after surgery,” he notes. “In fact, the chance of polyp regrowth after surgery is 100% without postoperative therapy. Patients with nasal polyposis have had to deal with this condition for the rest of their lives.” EVMS is the only site involved in all five and possibly six biologic studies evaluating nasal polyposis in the world. Dr. Han also was a lead investigator on clinical trials for sinusitis treatment approved just last year: Sinuva, an implant that delivers an anti-inflammatory steroid directly to the site of polyp growth. Additionally, he was one of the lead authors for Xhance, an exhalation delivery system of fluticasone that increases intranasal corticosteroid deposition into the nose and sinuses. In another clinical trial, Dr. Han, along with Dr. Kent Lam and his research team, are evaluating the effectiveness of cryoablation of the posterior lateral nasal nerve in cases of rhinitis. This office-based procedure could help patients’ symptoms without further use of medication or need for nasal surgery. Fittingly, Dr. Han believes he likely gravitated to his specialty in part due to his own struggles with severe allergies, asthma and sinus problems as a child. His two children suffer from allergies as well. “I have a lot of empathy for what my patients go through,” he says. “My conditions are under control now, but I remember exactly how miserable I felt.” The ENT field also combines his love for both medicine and surgery, he adds. Originally, however, Dr. Han chose medicine as a way to do mission work around the world. His parents, who immigrated to the United States from South Korea, became pastors and instilled a deep faith in their children, as well as a desire to help others. A molecular cell biology major at the University of Washington, Dr. Han earned a medical degree at the Medical College of Pennsylvania and completed a residency in Otolaryngology at the Medical College of Wisconsin. He followed that with a Rhinology and Sinus Surgery Fellowship at Oregon Health and Science University. Dr. Han arrived at EVMS in 2007 after serving as Director of Rhinology and Endoscopic Sinus Surgery at the University of Virginia School of Medicine. By then, he had secured National Institutes of Health funding for his research on how sinusitis, asthma, and allergy may be related. A prolific author, Dr. Han has lectured to physicians worldwide and assumed numerous leadership roles. He will become President of the American Rhinologic Society (ARS) in fall 2020 and is an Associate Editor and on the Editorial Board for the International Forum of Allergy and Rhinology, the official journal for the ARS and the American Academy of Otolaryngic Allergy (AAOA). In addition, Dr. Han is the only physician who is a fellow of all three major national organizations that specializes in the treatment of allergy and sinusitis: the ARS, AAOA, and the American Academy of Allergy, Asthma and Immunology (AAAAI). 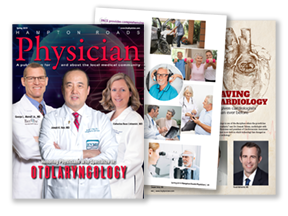 More locally, Dr. Han is the Chairman of the Virginia Society of Otolaryngology, as well as the Past President of the Tidewater Otolaryngology Society. Outside EVMS, Dr. Han and his wife, Dr. Caroline Han, a family practice physician, have done medical mission work in Bolivia, and he also has traveled to Moldova and China. Dr. Han hopes to take their children, Joshua and Alicia, on mission trips once they are a bit older. In his off hours, his hobbies include golfing and fishing.